This is the grandfather of the Glock pistols, the model that came at the very start. The original fired 9 mm rounds, and this licensed replica, which shoots both 4.5 mm pellets and steel BBs with a muzzle energy of about three joules, promises loads of fun. The metal slide is visually impressive and gives the gun its remarkable weight. The blowback makes every shot feel like the real thing, and with its rifled barrel the Glock 17 delivers excellent precision. This is a true collector’s item. 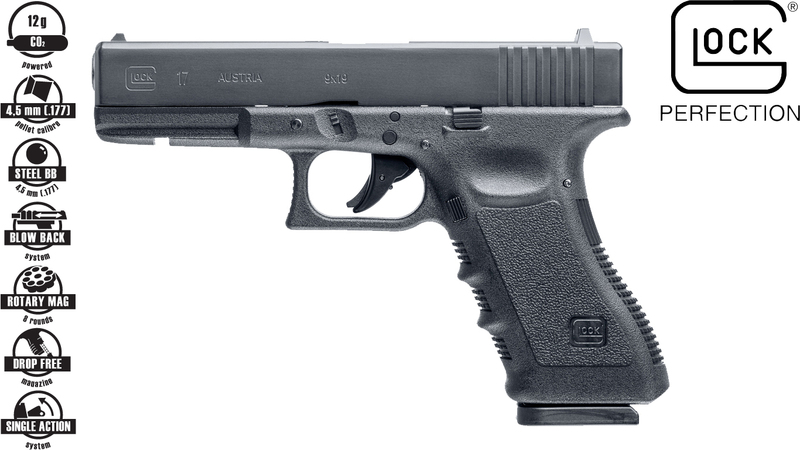 It comes in an original Glock gun case and is a must-have for fans of this famous pistol.